To see how much T.J. McConnell has grown in his years as an NBA player, one needs to only look up a picture from his rookie season of 2015-16, when McConnell sported a buzz haircut that perfectly matched his crooked smile and boyish looks. It is a headshot that would probably unnoticeably fit inside a high school yearbook better than an NBA team’s media guide, but that’s what McConnell’s life has always been about—the older-than-his-looks kid who set seemingly unachievable goals that he somewhat miraculously reached. Now in his third season with the Philadelphia 76ers, the Pittsburgh-area product has become a fan favorite due to attributes that fans in this area adore: tireless worker; painfully honest; overachieving and greatly appreciative of what he has been able to accomplish. One thing that the 62 guard isn’t is satisfied. Never has been, never will be. One of three children to Tim and Shelly (brother Matty, sister Megan), McConnell showed at a young age his desire to set what appeared to be unreachable goals that often made his peers and elders roll eyes or burst out into full laughter. Years later, while a new member of the then downtrodden Sixers, few would believe he was a professional athlete. Just ask the bouncer at Xfinity Live! who made McConnell pay a cover charge on a night when admission was free to anyone with a Sixers ticket stub from the game he just played in. 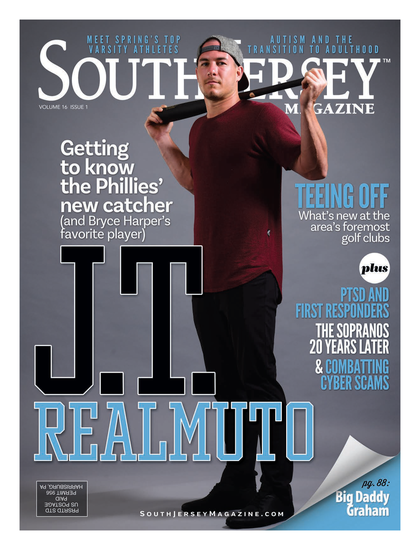 “He was always a scrawny little thing,” says Tim, who had the dual role of father and basketball coach when T.J. attended Chartiers Valley High School right outside of Pittsburgh. “Even before he was in high school, he told everyone that he was going to be a Division I basketball player. To hear it come from a kid that was just so small was pretty funny to a lot of people. But there was this fire inside of him that you just couldn’t deny. A dilemma was presented to Tim McConnell’s basketball team during his son’s freshman season when a soccer injury sidelined his starting point guard. The next option was the 5-4, 104-pounder who believed that one day he would be lacing it up in the NBA. McConnell surpassed all expectations that season—maybe even his own—and became an integral part of his dad’s program that season. He went on to become the best player in school history, scoring over 1,000 points in his senior year alone. That led to fulfilling his goal as youngster as he accepted a D-1 scholarship to Duquesne. But even that wasn’t enough for McConnell as after two seasons, a new challenge needed to be met. He was in the middle of lunch with his then-girlfriend, now-wife Valerie, when a call came from Sean Miller, head coach at the University of Arizona. A wildly successful career at Arizona saw McConnell’s two teams post a 67-9 record, including a Final Four run his senior season. He was the ultimate catalyst of the team from his point guard spot, though he didn’t garner much, if any, talk when it came to the upcoming NBA draft. Again, it was time for McConnell to prove himself and, again, he did, playing well enough in summer leagues for the Sixers to warrant an invite to training camp. The problem was there were already five other point guards on the team’s training camp roster. No matter, as McConnell’s hustle, knowledge of the offense and overall court awareness pleased the eyes of coach Brett Brown and his staff enough to keep him around. He has grown from deep sub to starter on bad teams to key backup on the current team that is fighting for an upper-half seeding in the Eastern Conference playoffs. And while his basketball career has been highlighted by high school state championships, a Final Four run and his ultimate goal of NBA player, no moment yet has ever topped the night of Feb. 12 of this season, when McConnell posted a triple-double with 10 points, 11 assists and 10 rebounds in a win against the visiting New York Knicks. He became the first player in franchise history to post the feat while coming off the bench, but that wasn’t why the night was so special for McConnell, nor was it because the team had posted its fourth consecutive win. The satisfaction was reached because of the reaction from his teammates. Superstars Joel Embiid and Ben Simmons were kid-like giddy when that final rebound was corralled by McConnell. Others jumped and laughed in sheer joy for their undersized teammate. The water, Gatorade and chocolate milk shower supplied by teammates in the locker room following the win only cemented the finest basketball moment of his life. “I think Joel was as excited for me to get the triple-double as I was, maybe even more so,” McConnell says. “To watch my teammates’ reaction and feel the energy of the fans was a feeling that I really can’t describe. And then to come off the bench the next game and have the fans cheering for me as I went to the scorer’s table was absolutely awesome. In Brett Brown, T.J. McConnell has a coach not unlike himself. Brown’s father, Bob, was also his high school coach. So both had to learn the balance needed to be a son and player. But while Brown loved to test the limits of his father’s/coach’s rules—timing curfews to within seconds, challenging oncourt situations—McConnell didn’t. “We went to his sister’s basketball game recently and when we walked into the gym, they started chanting ‘T.J. T.J.’ It was pretty cool. They were treating him like a hero, which he and I know he’s not. He’s an inspiration, though,” Tim says. Though a Pittsburgh native, McConnell grew up a Sixers fan, especially of Allen Iverson. Fitting that such a scrawny kid adored an undersized superstar. Fitting. 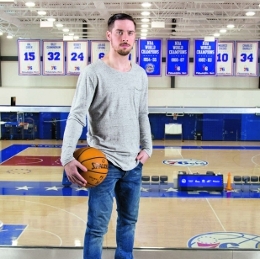 Reaching his goals is what T.J. McConnell has done all his life.